The principles of C.A.G.E. are in full agreement with the notion that public health authorities have the responsibility to protect us from hazards from which we cannot protect ourselves, or those of which we may be totally unaware of. The latter applies especially when we rely on third parties to supply us with food products that we have absolutely no control over with respect to their production, processing and handling. We should all be thankful that we live in a country where Health Canada sets high standards and stringent regulations for food productions, and enforce these by conducting regular inspections in facilities that handle commodities for human consumption. Foodborne illnesses can be a serious threat. Where we at C.A.G.E. draw the line, however, is when the state's ''protection'' offices and agents seek to protect us from our own choices. We as consumers may wish to, and have a right to make decisions for ourselves that differ from the State-approved norm. We may choose to deviate from the mainstream because of beliefs that differ from those of the health authorities, or because some of us are natural risk takers, or for any other reason personal to us. For instance, should some of us wish to take the risk of consuming the fish that we ourselves pulled from waters that are known to occasionally exceed permissible levels of mercury, should Health Canada raid our refrigerator and seize our catch of the day? Should they fine us or jail us for it? What if we decided to hire someone to catch that fish for us? Should the person that did the catching under our orders be accused of breaking the law for rendering this service? The answer to each of the above questions should be a clear and emphatic ''No''. And yet, it seems that the above nightmare scenario is presently occurring with respect to raw milk. - Why are they interfering with our choices when we willfully and in full knowledge decide to consume something that is not unlawful to consume, but only unlawful to sell in a regulated producing facility? - Would they interfere to the same extent if we raised chickens in our backyard and hired someone to care for them? Would they stop us from consuming the eggs? - Who exactly are they protecting with such zeal and fervor - we the consumers or the supply management cartels as Karen Selick, the author of the article, observed? We trust that you will find the article below as infuriating and frustrating as we found it. Queen Elizabeth drinks her milk raw. She reportedly thinks so highly of unpasteurized milk that when her grandsons Princes William and Harry were schoolboys at Eton, the famous college near Windsor Castle, she instructed herdsman Adrian Tomlinson to bottle up raw milk from her Windsor herd and deliver it to them at school. Canadians, however, are not permitted to emulate their head of state. Raw milk cannot legally be sold in Canada, except into government-authorized “supply management” cartels, where it goes to be pasteurized. Only those who happen to own their own cow can legally consume raw milk. A group of some 450 British Columbia city-dwellers thought they had a solution. They organized Home on the Range Dairy, and jointly acquired a herd of 25 cows. Then they hired farmer Alice Jongerden to look after their cows—feed them, milk them, bottle the milk, and make it available to its owners. This type of livestock boarding contract has long been known to English law. In fact, there’s even a special name for it: agistment, the taking in of livestock to graze on your land in exchange for payment. Ms. Jongerden is called an agister. But the Fraser Health Authority disapproved of the arrangement and took Ms. Jongerden to court. The real question, which no B.C. court has yet tackled, is whether she can be considered to be “selling” or “supplying” raw milk in contravention of the Milk Industry Act, when the individuals who receive it are already its owners. Nevertheless, the B.C. 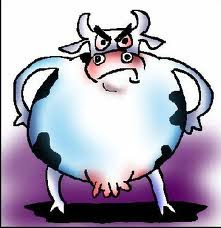 Supreme Court issued an injunction this past March prohibiting Ms. Jongerden and others from “packaging and/or distributing raw milk and/or raw milk products for human consumption.” But the cows took no notice of the Supreme Court and continued to fill their udders twice a day. They had to be milked or else they would soon be bellowing in pain, risking udder infections and possibly dying. Ms. Jongerden continued milking, placing the milk in bottles clearly marked “Not for Human Consumption” and “Not for Sale”. The owners could have pasteurized it themselves if they had considered it hazardous. They could have bathed in it, used it as plant fertilizer, or fed it to their pets. Only they know what they actually did with it. Ms. Jongerden, however, was charged with contempt of court. On September 14, a temporary order was made, prohibiting her from engaging in the “further production or distribution of raw milk”. She goes back to court in mid-October. -Milk the cows and dump the milk on the ground. The situation is ridiculous. The milk is there. People have bent over backwards to get it. They’re all aware that the Health Authority thinks it’s dangerous. They still want it. But instead, it will probably be destroyed—wasted—purportedly to protect people from taking a risk they are willing to take. Canada is out of step with the rest of the world. The United Kingdom, France, Germany and many U.S. states have programs that allow public health authorities to certify a dairy’s output as safe for raw consumption. In France and Italy there are even vending machines dispensing raw milk to eager consumers. B.C. residents can cross the border to Washington state and buy it legally. We don’t ban balloons even though some eight or nine children die annually in North America from choking on them. We don’t prohibit skiing, hockey or even parachute jumping despite the risks of injury or death. We don’t ban seafood, ground beef, poultry or coldcuts even though they are far more common sources of food poisoning than raw milk. One can’t help suspecting that the fanaticism of Canadian authorities towards raw milk has more to do with protecting the supply management cartels than protecting public health.